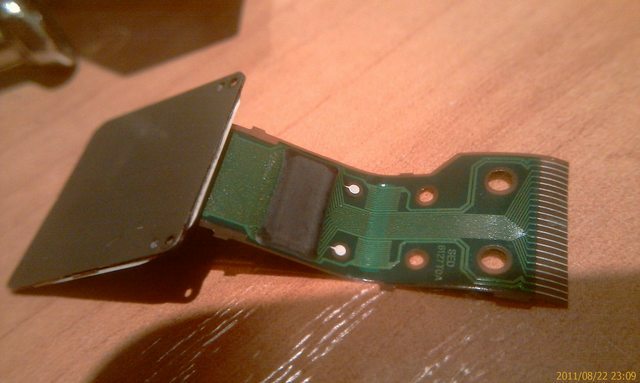 Project Help and Ideas » Running Piezoelectric Inkjet Printer Printhead. Hello, Is there any one has tried to fire Print head using nerd kits? I want to built a powder based 3d inkjet printer that uses as binder plaster, distilled water. If success it can be used also mobile wheeled inkjet printer Project too for any flat surface. Thanks for NerdKits Help me to achieve my goals. Isn't a print head just an array? If so probable the Nerdkit's LED-Array project could be transformed. Depending on the array grid you could also use shift registers, but again you are just firing rows and columns! Search the Nerdkit forum for lots of discussions about the LED-Array and shift Registers. Where did you get the ball screw? Are you building a XY table? You should post a description of your stepper motor work here in the Projects forum and at the Nerdkit Library Projects. it is a lead screw. It is ready built in any DVD player. it is actually mini bipolar stepper motor with low torque. 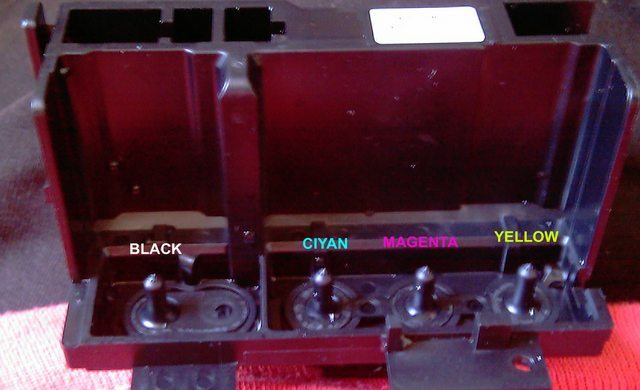 Other stepper motor from Epson C67 inkjet printer. It is specified as 42 volt 1 Amper. But i was testing on USB power. So on higher speeds it did not moved. only slow speed steps can be able to move. 4x 2 piece 2n3904 Transistors and 4 x2 piece 1n4007 Diods has been used to built 2 piece H bridge driver for the bipolar stepper motor. Do you have a schematic of a circuit? What piezo print head are you trying to use? What voltage does the nozzle require? You can do higher voltage switching with transistors. I have a Epson C67 i have ripped off. I purchased an extra print head and continuous ink supply. i have not measured what voltage is. thats what i wanted to know. When i will test it, i will make from low voltage and some variable frequence. I will know what is max when i burn it :) I may be measure output. But this epson printer checking cardridge installed condution. So voltage measurement quite difficult. Didn't you get any documentation with the print head you purchased? Where did you purchase the new print head? There probable are other forums focused on 3d inkjet printers you probable would get better answers their. We are limited by what you are telling us. I have only epson service manual that I have downloaded from internet. It is showing some information about print head nozzles that how many nozzles for which color. 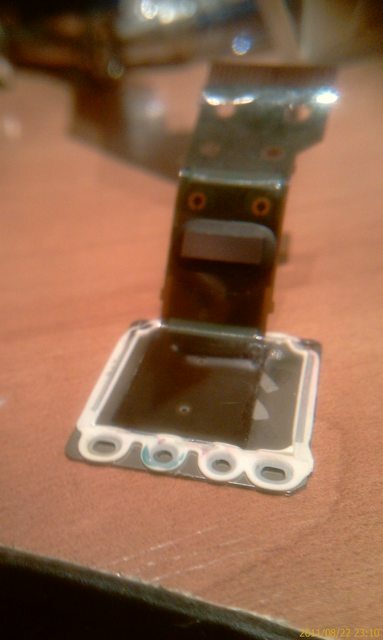 Print head has an IC module comes together. Probably it s made first to reduce the cable quantity, second is control the ink level and quantity. If I can bypass them and use nozzles directly with nerdkits Led matrix, without it's own IC that print head may work. I am sorry I missed one of your question. I have purchased print head online here one of russian website. It is Made in Endonesia. I also purchased some used Epson C67 and more older models too. I will try first with the old printers. I think it could be find on the ebay too. There are Yahoo Groups to modify inkjet printers but. They are not deeply discussed into electronic. Their focus mainly to modfy mechanical parts and hack the printer. My focus is to make electronics under control. I have ripped off already not good printing old Epson C42 PrinterI have checked print head pin out marked them. But not at all. I decided to see what is inside print head. 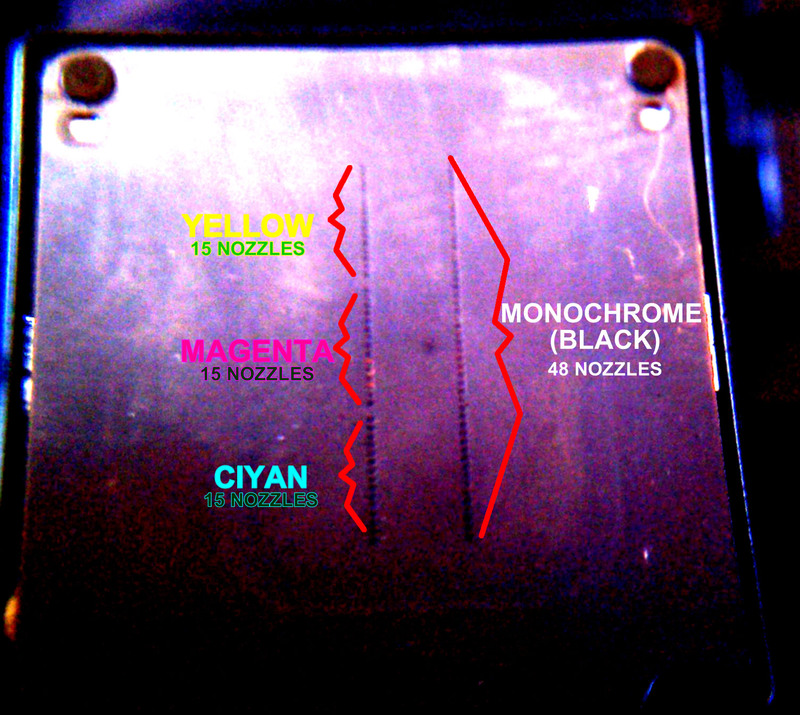 and how do they arrayed 48 monochrome, 15 x 3 color nozzles and addressed. They hide a multiplier IC inside the head. 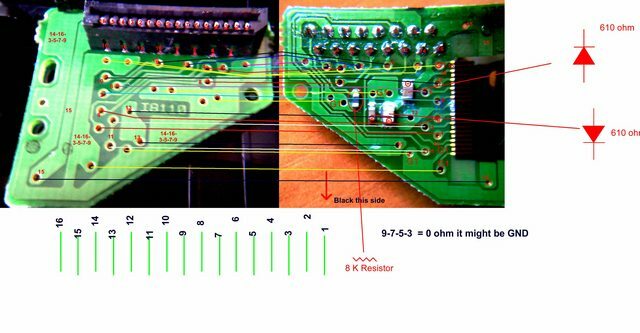 I think There is two way; 1. way : decode all the pins and learn how this multiplier chip works! 2. way cut that wires, from the IC and solder that micro tiny printed cable channels in to a flexible cable set and connect to the nerdkits LED matrix circuit. "Printhead cartridge carrier. ", "Click For Original Size"
"Printhead Pin Definition", "Click For Original Size"
"Printhead Nozzle Definition", "Click For Original Size"
"Printhead ripped off from the control board. ", "Click For Original Size"
"Printhead ripped off from the control board and the carrier. ", "Click For Original Size"
If you want look HD original size all of the album that I have uploaded link added below.